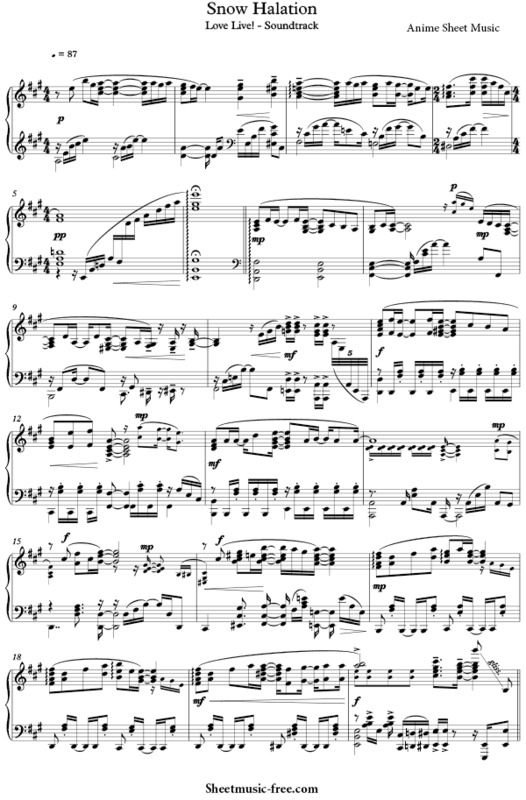 “Snow Halation Sheet Music” by Love Live!, “ Snow Halation Sheet Music” for Piano, Anime Sheet Music / Original key: A Major, number of pages sheet music PDF: 6, Video Piano Cover and Lyrics song Snow Halation Sheet Music. “Snow Halation’” (Japanese: ?????! Hepburn: Rabu Raibu!?) School Idol Project is a Japanese multimedia project, An animated film titled Love Live! The School Idol Movie was distributed by Shochiku and released in June 2015. Snow halation is ?’s second single. It was released on December 22, 2010 on both a CD and a DVD, in order to celebrate the upcoming Christmas Day. It is also included in all of ?’s solo albums and ?’s Best Album Best Live! Collection. It was also used as an ending theme for episode 9 of Love Live! School idol project Season 2. Sheet Music Title: Snow Halation Sheet Music Love Live! Snow Halation Sheet Music Love Live!. Lyrics Snow Halation Sheet Music Love Live! It’s strange, This feeling I have right now. It’s almost as if it came falling down from the sky. The color of this special season excites my heart. The melody of my heart has shouted a sign. I can’t stop, I won’t stop, Why? It’s vexing but it’s a pure-hearted devotion called love. Even amidst a slight fever I can’t hesitate. Accepting the courage to dive in, I’ll soon Start!! My heartbeat quickens to the future starting now. Wherever you are, No matter where, Fly high! Before I knew it, my “True emotion” had grown so large. It’s painful only seeing it as a dream! The one I want to call my lover is you. I can’t be bewildered by your gentle eyes! Take all my affection as it is all at once, Please!! Snow Halation Sheet Music Love Live!